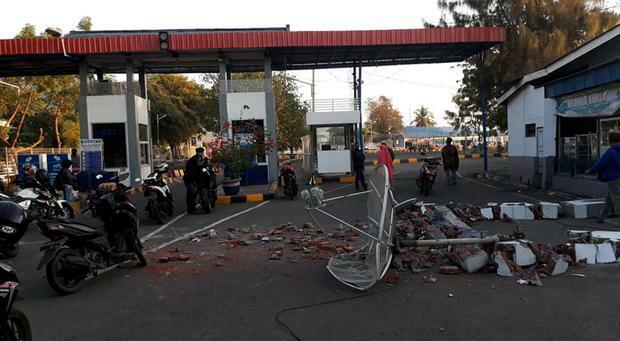 Multiple strong earthquakes toppled buildings across the Indonesian island of Lombok and killed at least three people as the tourist hotspot was trying to recover from a deadly tremor earlier this month. A shallow magnitude-6.9 earthquake that hit at about 10pm was one of several powerful earthquakes on Sunday in the north-east of the island that also caused landslides. The night-time tremor was followed by strong aftershocks. Two people died when their homes collapsed on Lombok and the neighbouring island of Sumbawa, National Disaster Mitigation Agency spokesman Sutopo Purwo Nugroho tweeted on Monday morning. Another person died earlier on Sunday during a magnitude-6.3 earthquake. The swarm of tremors caused panic in parts of Lombok, but many people were already staying in tents following the deadly jolt in early August and its hundreds of aftershocks. On Sumbawa, a neighbourhood was engulfed by a fire that started in a collapsed house. Dwikorita Karnawatim, who heads Indonesia’s Meteorology and Geophysics Agency, said buildings that had not yet collapsed had suffered repeated stress, and authorities have urged people to avoid both the mountain’s slopes and weakened buildings. Sunday night’s tremor occurred on a different fault and was not an aftershock of the magnitude-7.0 earthquake on August 5 that killed 460 people, damaged tens of thousands of homes and displaced several hundred thousand people. The tremor lasting five to 10 seconds also was felt in the neighbouring island of Bali and as far away as East Java and Makassar in Sulawesi. Earthquakes earlier on Sunday caused landslides on Rinjani, an active volcano. Video shot by the Indonesian Red Cross showed huge clouds of dust billowing from the mountain’s slopes. Indonesia, a sprawling archipelago that straddles the Pacific “Ring of Fire”, is prone to earthquakes and volcanic eruptions.